1) Speed camera vendor ACS State and Local Solutions (A division of Xerox Corporation) was revealed to be running "Astroturf" website, claiming to be grass roots organizations supporting speed cameras in Baltimore County and Howard County, when in fact they were started by a public relations company hired by ACS. ACS revealed their affiliation with the websites only after the association was revelead by Patch.com. The campaign nevertheless proved successful, with the Baltimore County County voting to expand their program and Howard County voting to begin a new speed camera program. 2) A legislative change, which would have required that "workzone speed cameras" only be deployed in workzones where there are actual workers, was rejected by the state legislature. Current law permits "workzone" cameras to be used "regardless of whether workers are present", and many if not most of the tickets issued by SHA cameras so far have been issued when no work was taking place. The SHA this year began deploying cameras on I-270, in a zone where the speed limit is reduced by 10mph, and on the DC Beltway (495). 3) Legislation was proposed which would have removed all police oversight from the issuance of speed camera citations. StopBigBrotherMD.org argued that this change would increase the likelyhood of errors and a reduce accountability by local governments. The requirement that sworn police approve citations was one of the main arguments made by camera supporters that there is an adequate level of review before citations are sent. The proposal which was rejected but the City of Rockville is lobbying to revive it, along with the city of Laurel (who initially proposed the change in 2011), and by the City of Gaithersburg. 4) Claims that all photo citations are currently inspected by police were questioned. In one incident, the City of Baltimore issued 2000 red light camera tickets which had been "approved" by a police officer who had been deceased for months. In another incident, Baltimore ticketed the wrong vehicle. The citations in fact did not clearly show the vehicle at all, and the plate number was not clear, indicating that citation review procedures apparently do not always include looking at the citation images. The ticketed motorist was forced to spend months getting the bogus citation removed from his record after this registration was flagged by the city. 5) It was revealed that speed cameras provided by speed camera vendor ACS to the SHA's freeway workzone camera program, to Baltimore County, and other jurisdictions all failed to meet a requirement that they be certified by an "independent calibration laboratory", instead the cameras were all certified by the vendor. Baltimore County was unable to answer questions about the testing of their cameras at the time of our inquiry. After StopBigBrotherMD.org exposed the fact to the state legislature and members of the press, ACS arranged to find a company willing to re-certify the devices.... meeting the letter of the law only after the devices had already been in use for over a year and issued hundreds of thousands of citations. Even after that, the devices were still only tested according to a "manufacturer specification", testing the frequency the devices transmit on, and were not certified by the IACP (a much higher standard that was a requirement of the SHA's rfp for speed monitoring systems). 6) Some jurisdictions in Maryland are engaging in the practices of issuing red light camera tickets to vehicles which come to a full stop but are past the white 'stop line'. The practice has been defended by Prince George's County authorities. Other jurisdictions have been issuing red light tickets for other types of "technical fouls" including rolling right turns. Public relation campaigns by camera vendors and local governments supporting red light cameras almost always focus on 'straight through' red light running, despite the fact that when 'technical fouls' are ticketed only a minority of tickets are for actual red light running. 7) The consumer advocacy group USPIRG released a report cautioning on the privatization of law enforcement associated with automated enforcement. The report cited the effects of turning law enforcement responsibilities over to for-profit companies, typically under contract arrangements which incentive them to maximize the number of tickets issued (a common practice in Maryland). It also warned of the political clout camera companies have accumulated through lobbying activities to increase the revenue potential of cameras. The report also warned that private vendors can conceal information from the public since they are not subject to Freedom of Information Act requests. 8) There has been an ongoing dispute over the accuracy of speed cameras built by Optotraffic, a division of Sigma Space Corporation. A business owner in Forest Heights successfully contested several citations issued to vehicles run by his business using time-distance calculations from citation images to show that the vehicles could not have been traveling the speed shown on the citations. Another motorist presented electronic evidence recorded by a "carchip" showing his vehicle had not been traveling the speed on the citation issued by an Optotraffic camera in College Park. Other motorists made their claims publicly in letters to the editor. Forest Heights responded to the charges by plagiarizing an earlier response from the town of Cheverly where similar claims had been made earlier. There were also frequent denials of requests for information about camera programs under the Maryland Public Information act, camera logs which appear to have been falsified or filled out weeks after the fact, and motorists who tried to contest citations but were unable to get hearings for months or in some cases over a year. In addition, it was discovered that Optotraffic had removed information from citations, specifically lowering the precision of the timestamps from 3 decimal places to 1, after motorists started using the timestamped images to challenge speed readings. Optotraffic continued to deny the errors, and public officials in Prince George's county remained unconcerned about the issue, which the county having already selected Optotraffic as their vendor (a company which had made thousands of dollars in contributions to the campaign and inauguration of the county executive.) Prince George's County unveiled a plan to deploy 72 new speed camera sites, with proposed locations including newly minted school zones created solely for speed camera use. One of the new cameras experienced technical glitches shortly after going online, but nevertheless the first few cameras pulled in $527,000 worth of fines in the first month. 9) After the county program started, Prince George's county courts eventually stopped hearing arguments about accuracy all together. One motorist contesting a citation from Forest Heights was arrested and throw in a detention cell merely for stating "I was not speeding" in court. Another Prince George's County Judge threw out the presumption of innocence completely, stating to an entire courtroom full of defendants prior to hearing any evidence that "The only defense that the court is going to accept if you were not the driver of the vehicle" and that the court would not consider any evidence questioning the accuracy of the devices. 10) Eventually the town of Cheverly disclosed documents PROVING that errors with Optotraffic cameras were real . The town's contract with Optotraffic was ended after the vendor failed to respond to questions from the town about errors, including cameras "recording" a bicycle going 57mph, "invisible vehicles" traveling 76mph, "false triggers" caused by moisture in the air, and "false speed readings for vehicles that have an irregular size such as buses and trucks with ladder racks." 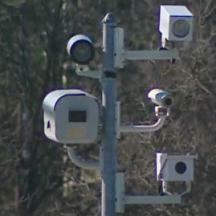 Optotraffic cameras are still being used in numerous municipalities, issuing thousands of tickets per month. Given the rate at which automated enforcement is growing in the state, we're sure 2012 will be even more "interesting" than 2011. We'll be all over it.